For 32 years I am a teacher at the school with the Bible in Suriname. I am a dedicated teacher and love my profession. From childh...For 32 years I am a teacher at the school with the Bible in Suriname. I am a dedicated teacher and love my profession. From childhood, I wanted to be the teacher. With nieces, nephews and neighborhood kids playing school in the afternoon. Leaves from old notebooks, pencil stubs and the wall was the material we used. Only the teacher had a book, because she had to teach the children! What a great position to be the teacher. I started as a teacher in the elementary school in the district Marowijne in Suriname. An experience that made me grow to be the teacher that I am today. It's a nice job and you must listen to the children. All children are welcome even the naughtiest child. Rules and agreements are very important to me. In the school, I'm the motivator and the tractor. My starting point is: in every situation, we can learn something to and from children. In our conversation, we will get to know each other. Who am I and who are you. A question I'll ask is: where is your interest for this visit? For example, do you want to know more of my person as a teacher, or about the school system I will give you a tour, where you can visit the classroom, the school grounds and offer you a refreshing drink. I'm Mrs. Marjorie Sumter Alleyne and was born on March 18 1964.I am the third child of my mother and have four children, three boy...I'm Mrs. Marjorie Sumter Alleyne and was born on March 18 1964.I am the third child of my mother and have four children, three boys and a girl. At sixteen years, I started with home crafts, baking cake, cookies, making pickles and stewing fruit. I am also milliner and love beautiful clothes. My favorite garment is a koto. And my favorite foods are rice, pom and pies. I also love to dance. I started my own business because I always wanted to stay at home with my children and I didn’t have no babysitter. I had to work and earn money, so I chose to work at home. My hobby became my job. My goal is to continue growing in what I do and to share it with people. I want my products to be known and that everyone can enjoy it. I give you a workshop where you first taste the delicacies. In my cake you can always taste the best essence. In my pickles you always taste salt, sour and sweet at the same time. After the tasting I talk about the ingredients of the delicacies, for example Cornstarch cookies, Karoe Bojo, Cassava and Pommesiter and Mope. Than you may choose the tidbit you want to make yourself. I will give you directions and we ensure together that you yourself bake a delicious cake or make tasteful pickles. Since 1957 Mr. S. Pahori aka Rini Shtiam manufactures Surinamese clay in his pottery. In his simple stiled Pottery he now works wi...Since 1957 Mr. S. Pahori aka Rini Shtiam manufactures Surinamese clay in his pottery. In his simple stiled Pottery he now works with many pupils from Surinam schools and teach them how to make a beautiful object of clay.Besides that he is a potter,he also writes poems in Hindi . He likes it to read these poems to the visitors. 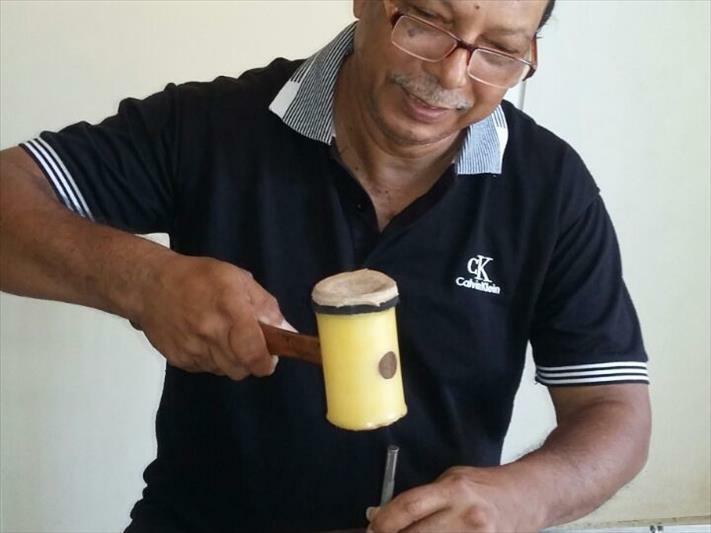 During the workshop you will sit quietly and drink a glass with lemonade, because it is hot in Suriname and you have to drink enough .He will tell you his personal history as a potter and Hindi poet in Suriname. After this acquaintance there follows a tour in all sorts of beautiful pottery, which he sometimes makes alone and occasionally with his wife Yvone Parohi..After the tour, you yourself will create a pretty jar or other container of clay" I will guide my visitors to understand how they can work with clay" The object you create is not quite ready on the day of the workshop, because it is to be baked in the oven. If you want to recieve your object it can be delivered. My name is Clifton Asongo, I'm a drummer in a cultural dance group. I love it and find it very interesting to work with people thr...My name is Clifton Asongo, I'm a drummer in a cultural dance group. I love it and find it very interesting to work with people through music, song and dance. It's in my genes. Young people from different neighborhoods around Paramaribo come to our training facility to participate or watch. In my group, I play the Apintie drum. Other group members play the Siksiki (Maraka) sing and dance. We form a Aukaanse dance group named Fiamba (The meaning of Fiamba. A little birdie with a lot of power) In the workshops, we will tell you about the type of tools we use to make the music. The Apinti drum, the Maraca and the Kawai's (anklets). We'll tell you about the various dance and singing performances; the dancing entertainment Awasa, Songe, Banamba (Saramaccan abdominal and hip dance) and Aleke Loketo. These are traditional and modern African dances. After these stories, it is the time for you to learn drumming and dancing. Under the guidance of four to eight member’s visitors will be engaged. You learn to play the drum and learn to dance in the way the Maroons in Suriname do. The visit is also suitable for families with small children. A cool drink is included. Have you always been interested in Chinese culture? This is your chance to be introduced to one of Suriname’s greatest cultures! ...Have you always been interested in Chinese culture? This is your chance to be introduced to one of Suriname’s greatest cultures! At the workshops organized by Linda Landbrug, you can learn how to write Chinese characters and even your own name using brush and ink! If you want to know about the do’s and don’ts in socializing with Chinese, you can participate in the workshop Chinese Etiquette. You will be surprised in how the Chinese way of thinking differs from the western one. The ancient knowledge on fengshui tells you about how to furnish your home or office in order to improve your health, your social and love life! We will look into your own situation to determine how you can change your lay-out. Each workshop includes a PowerPoint presentation revealing interesting facts on the background of the subjects, information on paper, doing an exercise yourself, drinks and snacks. Linda Landbrug studied Chinese culture and languages at Leiden University, The Netherlands, and Nankai University, Tianjin, China. Ten years ago she and her husband and their six children migrated from The Netherlands to Sweet Suriname! 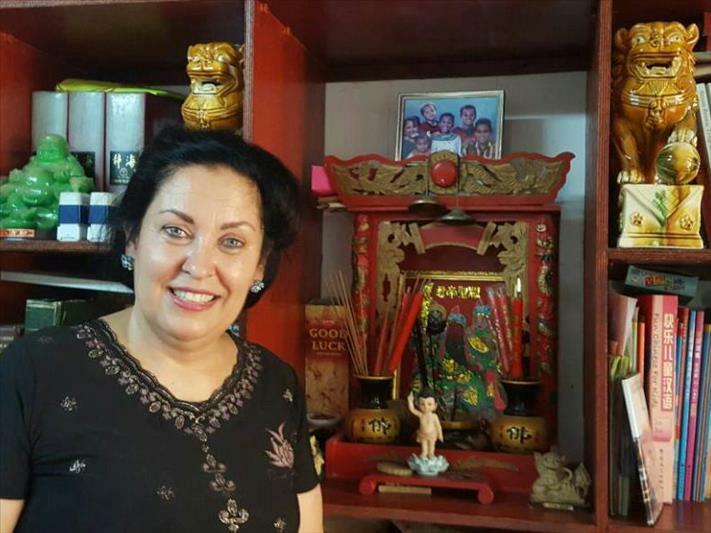 She has been teaching on the wonderful Chinese culture for over 30 years!